A rich, full-bodied base to make your own signature Matcha Latte. Just the right proportion of sugar and matcha to give your drinks and snacks a round, smooth flavor. Other serving suggestions are provided on the back label of each package. Recommended proportion: 1 teaspoon for each 3-4 oz. milk. Iced matcha latte: 4 teaspoons matcha latte powder; 12 oz. milk. Shake with ice in cocktail shaker. Hot matcha latte: for a 12 oz latte, use 3 teaspoons matcha latte powder; mix with about 10 oz. milk. The milk should be steamed using your espresso milk wand, or whisk while heating in a small saucepan on your stove. May also use a microwave. Watch your milk carefully; it will foam rapidly. Matcha Shake: 3-4 teaspoons matcha powder, 1 large scoop of ice cream, milk or ice, mixed in electric blender. 1 pound package of Matcha Latte mix; reclosable bag. Half-pound Matcha Latte mix, resealable. 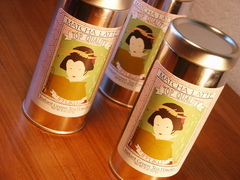 Description: The same great quality matcha latte in a cute silver gift tin. 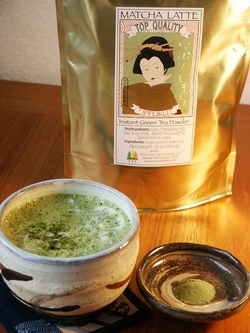 Description: Six one-pound pouches of Three Tree Tea's popular matcha latte blend. An excellent deal for high-volume users, or for sharing with friends.